Digital Signage is everywhere. Weather you’re in train stations, airports, fast food restaurants, shopping malls, office environments,or medial practices to name a few, you are surrounding by screens providing vital information. Digital signage has revolutionized and simplified the process of getting your message out there. Robust build quality- Commercial build quality that wont get damaged easily. Connectivity- Generous connectivity capable of handling different screen outputs , wifi and wired networks. Compact size- Capable of being easily accommodated, many of our systems can be mounted on the back of a monitor. Multi display output- all our PCs provide dual output, some offer triple display, and some even support 6 outputs. High quality video- some units can output in glorious 4k. Turn on after power is restored incase of power loss- all of our shuttle PCs have this option. The Shuttle DH110 has a a 1.3-liter slim design & a height of only 43mm, Our configurable system DH110 system can support 2.5″ SATA 6G HDD or SSD and built-in one M.2 2260/2242 with type M and one M.2 2230 type A/E slots to install M.2 SSD and a WiFi card. 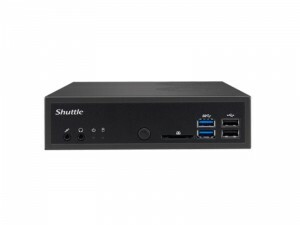 The Shuttle DH110 also includes a robust I/O interface with multiple USBs, and 2xRS232 (RS232 and RS232/422/485, both support 0V/5V/12V) Onboard Dual Intel Gigabit LAN ports provide high-speed data transfer capability and a better compatibility for business network environments as well as support WOL and Teaming mode function. The shuttle DH110 compact dimension means it is easily integrated into digital signage solution. The device is 24/7 certified. It runs quiet and cool throughout extended use due to Shuttle’s exclusive thermal technology. Its slim metal chassis is VESA mountable, highly connectable, and operational in 0-50°C ambient temperatures, again making it perfect for Digital signage. The excellent Intel graphics on the Shuttle DH110 are capable of 4k out via displayport. It also supports a HDMI connection, and optional VGA output.